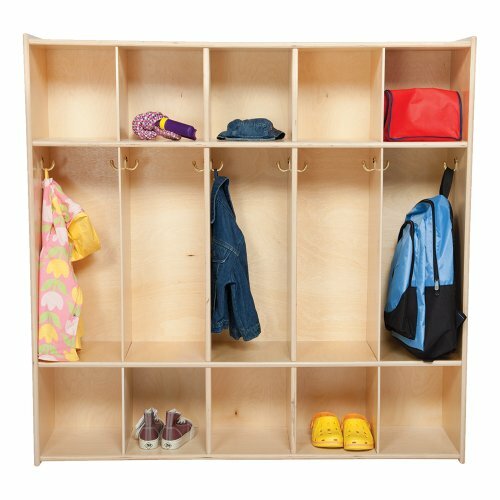 Encourage positive organizational habits with the Wooden five-section locker unit from Sprogs. Each Section features two single hooks for backpacks and jackets and an upper and lower cubby for smaller items. Open construction prevents injuries without Doors or hinges present, and you can keep an eye on personal belongings. Sturdy Baltic birch construction, rounded edges and a UV finish make this unit a durable, safe choice for busy classrooms. Backed by a 20-year warranty. Ships assembled. Each of the five kid-sized lockers features two single hooks for backpacks and jackets and an upper and lower cubby for smaller items. Open construction prevents injuries without doors or hinges present. Baltic birch construction features rounded edges and a tough UV finish. Unit measures 54" W x 12" D x 46 3/4" H.
If you have any questions about this product by Sprogs, contact us by completing and submitting the form below. If you are looking for a specif part number, please include it with your message. Sandusky Lee Kids Locker, LF1B151524-22 Single Tier Welded Steel Locker, 24"
Sandusky Lee Kids Locker,LF1B151548-05 Single Tier Welded Steel Locker, 48"
Sandusky Lee Kids Locker, LF1B151524-EY Single Tier Welded Steel Locker, 24"